Carlos A. Moreno is a "photojournalist who has a deep passion for documentary work and likes to share his vision about social change with socially conscious organizations that share his desire to make a difference with photographs." Carlos is based out of San Diego, California and lives near the U.S.-Mexican border. "'Picking up the Pieces' is a story about how a family and its neighbors barely survive in one of America's richest technological hubs, the Silicon Valley Area, home to the likes of Cisco and Google, and how even in such a place of success can working professionals like the Abdullahs still not make it and fall through the cracks. The Abdullahs survive day-to-day, starting early in the morning recycling and tearing apart computer parts, copper wire, and whatever they can find to make ends meet so they can stay in the hotel they've been inhabiting for two years now and feed their son, Shadeed. 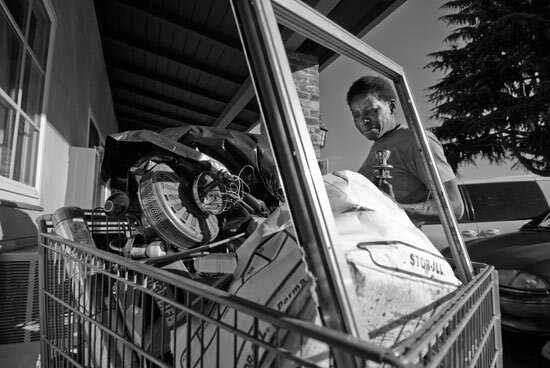 With much work and sacrifice they sometimes manage to gain enough for the day's rent and for tools to make recycling a "business," as Denise and Mahir Abdullah see it. Their lives are far and apart from what they use to be years ago, when both had lucrative jobs, he as an electrical engineer at Intel Corp and she as a childcare facilitator. The 2000 dot-com bubble destroyed their chances of getting ahead and with Mahir's skills now outdated and with a current and long-lasting economic slump neither has a chance of getting back on their feet. Though the odds seem stacked against them, they still persevere and even after facing such hurdles, help their neighbor, Tasha, a single mother who has a severe case of fibromyalgia and who is also struggling financially. View the full screen magazine photography feature.